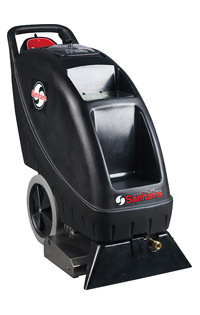 When cleaning is your business, the Sanitaire Self-Contained 9 Gallon Extractor is the walk-behind extractor for you. Get your cleaning done no time. 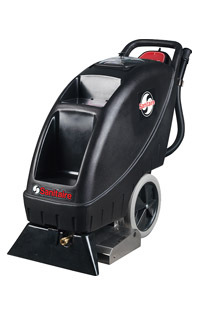 The floating brushroll, fixed vacuum shoe and 18-inch wide cleaning path provide maximum recovery and cleaning power. 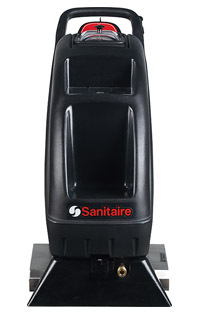 The Sanitaire 9G SC6095A self contained carpet extractor is great for hall ways, hotels, motels and much more. Simply just pull it along and let the machine do all the work. Q: Do you have Wand with Solution & Vac Hose that can be attached to this extractor? If you do can you give us the stock number and cost please? Q: What attachments are included with this machine? If not included in the $1599 price, how much extra to get both carpet and upholstery cleaning attachments? We are a carpet store and have a tax exempt id number, will we have to pay sales tax?